Devialet Phantom Reactor: a £990, 600-watt ‘mini’ Phantom wireless speaker | What Hi-Fi? Oh look, it's a wee Phantom! In the four years since its inception, Devialet’s Phantom wireless speakers have become some of the most iconic in the premium market. The speaker has found presence in grand spaces (such as London’s Royal Albert Hall and Paris’ Palais Garner) as much as it has in people’s home, but it’s the latter that Devialet wants to hit harder with its latest product. Enter the Phantom Reactor, a mini (toaster-sized) and more affordable (£990) Phantom - which is supposedly a response to customer feedback, and which Devialet hopes will further the now-four-strong Phantom family’s customer reach. Like its bigger siblings (the Classic, Gold and Silver, which now make up the newly-named Phantom Premier range), the Reactor boasts a uniquely impressive peak power output for its size: 600 watts, capable of a 95dB sound pressure level - around the loudness of a truck. For those wanting a few extra decibels of loudness, Devialet has also produced a more powerful (900-watt), and naturally more expensive (£1290), Reactor speaker too. The miniaturisation of Phantom to create a speaker four times smaller (3 litres in volume and 4.5kg heavy) was the the work of 100 Devialet engineers within a three-year project, and sees the Reactor follow the trademark spherical design with two push-push woofers on the sides. Like the other three Phantoms, the Reactor uses Devialet’s Analog Digital Hybrid (ADH) technology, which marries Class A analogue with Class D digital amplification. There's also Devialet's wonderfully-named Heart Bass Implosion (HBI) technology, which aims to provide deep powerful bass from the compact enclosure. The Reactor can play music over Bluetooth, AirPlay, DLNA, Spotify Connect or through a 3.5mm/optical connection. 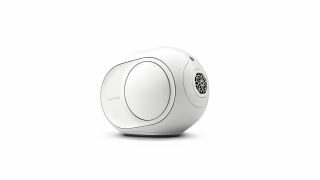 You can control it through a revised version of Devialet's original app. The Reactor will support the Phantom family’s multi-room and stereo pairing features sometime next year. The Devialet Phantom Reactor will be available to pre-order from the 10th October. In the UK, it will be sold in select Selfridges stores, London’s Harrods, Amazon and John Lewis online, and through Devialet’s own stores.